Protected and buffered bike lanes will replace standard bike lanes and sharrows, but are people on bikes being prioritized or just accommodated? At a meeting in Cole Tuesday night, Denver Public Works unveiled its latest plan to make Martin Luther King Jr. Boulevard and 31st Avenue safer for biking. 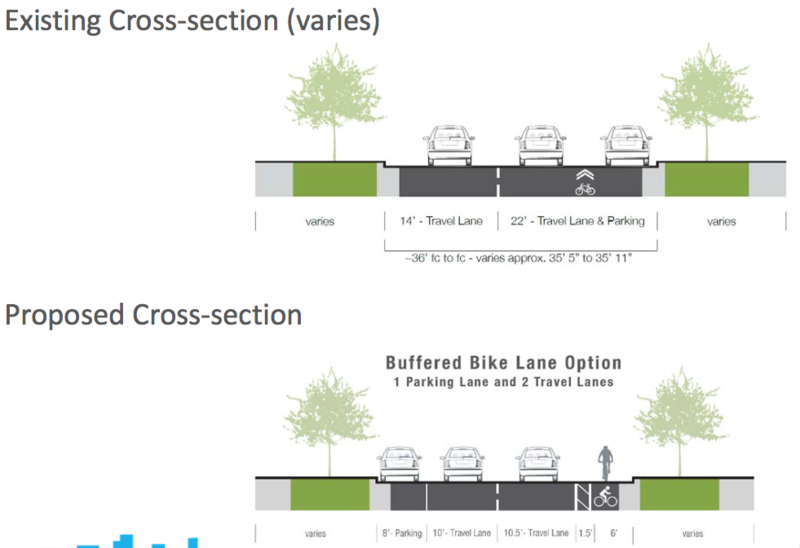 The current proposal would transform a standard striped bike lane on 31st Avenue into a parking-protected bikeway between Downing and High streets. Between High and Columbine Street, where the only semblance of bike friendliness comes in the form of a sharrow, the bike lane won’t be protected by parked cars. Instead, a 1.5-foot painted buffer will separate people on bikes from motor vehicle traffic on the speedy, one-way street. One block north, DPW will give the same painted-buffer treatment to MLK between Elizabeth and Downing streets, replacing sharrows. Both treatments fill gaps in the city’s bike network. Thirty-first connects to the Stout Street bikeway heading east, out of downtown, and MLK connects to the Champa Street bikeway heading west, into downtown. Both bikeways connect to the MLK bike lanes east of Elizabeth Street — which could also use some love. DPW will reclaim some on-street parking space to make room for people on bikes, and slim down driving lanes, which should slow down drivers. Right now the driving lanes are wide, topping out at a highly unnecessary 14 feet. The road diet will bring those widths to between 10 and 11 feet, depending on the segment. Mitchell, a mother of three, thinks the redesign will make it easier for her kids to get around in a healthy, safe way. And she’s hopeful that more people on bikes will activate parts of the neighborhood that she says can be unsafe after dark. No doubt the design is an improvement over current conditions. But there’s always the question of whether the city is accommodating people on bikes — who are the more vulnerable users of these streets — or prioritizing them. For example, DPW could trade more on-street parking for a protected bikeway on MLK and the full length of 31st, or at least thin out driving and parking lanes further, so that more than 1.5 feet separates people on bikes from traffic that regularly exceeds 40 mph. The National Association of City Transportation Officials says 10 feet is plenty wide. This version of the bikeway is what DPW calls “60 percent design,” meaning the plan is still malleable. The streets department will hold one more public meeting in October before finalizing the design in November, and implementing it — probably in the first half of 2018. What’s the posted speed limit for this section. So many of these issues could be addressed by a city-wide educational campaign: “Bicyclists Are Here!” or something better. These drivers are not dicks by and large — they’re just not primed to see bicycles and when they do, they get scared and panic. But the city has adamantly, knowingly repudiated this approach. Gotta wonder why.